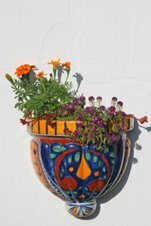 Wall planters are available in a variety of styles and materials. They add interest and depth to walls, fences, and gates. These planters are a space-saving solution if you live in an apartment or condo that is limited on space. Hanging wall planters are a great way to display your tropical plants and flowers. Wall Containers – What Are The Advantages? Ideal solution for adding tropical blooms and foliage to dull, hard to decorate outdoor spaces such as walls, fences, and gates. Enhance an interior tropical design theme by mounting planters filled with exotic plants and flowers. Can be hung in a variety of outdoor locations – porches, patios, balconies, decks, garden arbors, and fences. Wall plant containers display plants and flowers without taking up space. Decide what the planter will hold. Large displays require large planters. Determine the location. Choose a stable, secure structure that can hold the weight of the planted container. Choose a material that will complement your landscape as well as withstand the outdoor elements. Planters should be placed in a location that is easily accessible for watering. Mount planters on a stable structure, one that will withstand the weight of the container when it is planted. Choose the best plants for the container. Consider the size of the planter as well as where the planter will be mounted. Larger containers accommodate larger plants and will allow for root growth. The plants you select will also depend on the exposure to the elements (wind, temperature, and sun).